Only few more days left for the race and I do not feel ready for it at all this year. When Fr. 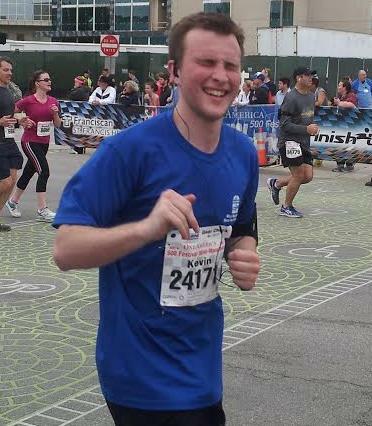 Mike asked me to write an article about training for the race for vocations and how it has helped my spirituality I was little hesitant because I felt like I have not kept up with a regular training for the upcoming 5K. Then as a catholic I was feeling guilty for not fulfilling a request of a priest. So I sat down in front of my computer on this rainy Sunday with the purpose of writing this article. When I think of running one of the scripture verses that kept popping in to my head is the famous verse from the second letter to the Timothy “I have competed well; I have finished the race” (2 Timothy 4:7). You may as well know this about me upfront: I am a distance runner. It’s one on of the things I grew up on. My older brother and I used to race each other at everything in the backyard. We would even create obstacle courses and see how many times we could each trim off the time of the previous “world record.” We ran laps around the house which eventually became laps up and down the street. We were the only two soccer players on the team who actually enjoyed running laps. When my older brother took to the track, I followed him just a season later. It cemented a relationship with running that I never have walked away from completely. I left it for a time when the pressure of racing became too much in junior high and for a few later stints, mainly when I struggled with injuries. 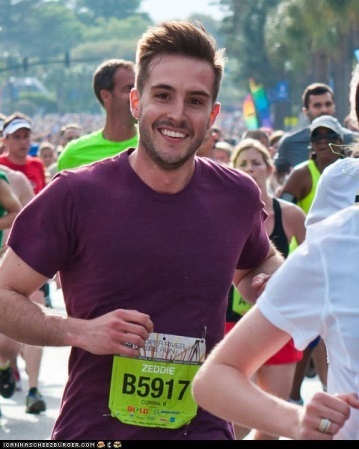 There’s a meme that’s made its way through the internet called the “Ridiculously Photogenic Guy”. It depicts a man crossing the finishing line after running a marathon, looking straight at the camera, and flashing a smile worthy of a Gap catalog model. It went viral because this guy, after running for 26 straight miles, looks like he was just out for a casual morning jog after rolling out of bed and throwing some mousse in his hair. This was my first mini-marathon, and my inexperience showed. My training was sporadic at best and my 13 minute mile pace was not going to break any records. Here’s the ugly truth: my race was messy. My shirt was two sizes too big, my headphones always seemed to be in the way, and I was sweating more than I’m willing to admit in a publicly posted reflection. After the race, my aching knees plagued me for weeks and I was utterly devoid of energy. To our knowledge, Eric Liddell never actually spoke these words. They were written for the 1981 film Chariots of Fire. But I think they are a fair representation of a man who knew his calling and his Creator. Liddell’s world record and Olympic Gold win in 1924 are well known and even immortalized some places. But often less revered, is that he was born to missionaries in China, where he returned a missionary himself. He died there in an internment camp during World War II. Eric knew running was not his highest purpose and walked away from fame and glory to serve in China, bringing good news to the poor. I am nowhere near as accomplished or talented as Liddell on the track. Though, I did chose to leave behind an encouraging running career to follow the Lord after high school. At that time, through the action of the Holy Spirit in my life, I realized that my purpose was not inevitably those things I was particularly skilled or good at doing. Neither was it necessarily the things which could gain me or God’s Kingdom recognition and good reputation. Nonetheless, I found running exhilarating. As I’ve grown in friendship with Christ, I believe I have come to experience His pleasure when I run. To feel someone’s pleasure is more than simply a realization of another’s happiness or mental state. It’s also different from feeling the same thing at the same time. After all, two people can be experiencing sorrow at the same time, even in the same place and time, but not be sharing each other’s sorrow. To feel someone’s pleasure describes a communion, where I experience your experience in me. I feel your pleasure in me. I was invited to participate in the Race for Vocations shortly after I began attending St. John’s. “Race for Vocations…What’s that? Was it a typo… did they mean “vacation”? I’d race for that!” By the following spring, God had rescued my prayer life and led me into deeper relationship with Him through Eucharistic Adoration and a thirst for the Sacraments. I had learned the meaning of “vocation” and had begun to grasp the truth that through the grace and inspirations of the Holy Spirit each of us is called to a specific role which no one else in the past, present, or future can accomplish. According to God’s perfect providence, fullness of life is imparted to us through the living out of our calling to the Priesthood, Religious Life; Sacred Married Life, or Sacred Single Life. Each of our vocations is divinely designed to bring about our ultimate happiness, through chiseling us into our best selves! I signed up for the race. Running has never been my forte but I faithfully (pun intended) hopped on the treadmill to offer up my training. I had never before thought about praying for my own vocation, let alone praying for anyone else’s, but that is exactly what I did. You’d better believe I was storming heaven with prayers, and not just through training but during the race itself and ever since. I owe a heartfelt “thank you’ to all who are promoting and participating in the Race for Vocations. Your witness, prayers, and hard work are beautiful offerings to Christ and He uses them all to bear fruit in the world! Being part of the “mobile cheer block” in a sea of racers proved to be a great example of the universal Church and the joyful excitement in the air was practically tangible as we wove through the city on a mission of evangelization. Although I didn’t have a clue who many of the other blue shirts were we were all supporting each other as we ran the race for Christ. “I have competed well; I have finished the race; I have kept the faith” 2 Timothy 4:7. Now that I am living religious life with my Sisters I can appreciate prayer even more. Community is hard but incredibly beautiful. It’s interesting to reflect on how I’ve become part of this Franciscan family when just a few months ago I gave up my car and cell phone, packed up my suitcase, and moved in with about 100 strangers. I was concerned about feeling cut off from the life I knew before entering the convent but the notes of encouragement and prayer requests I’ve received from friends, family, and even those I hardly know have been a great witness to me and a source of consolation and joy. How beautiful is the Bride of Christ, the Church! I am honored to participate in our devotion of perpetual Adoration of Jesus in the Blessed Sacrament. This was what drew me to the Sisters in Mishawaka and it is what sustains me day to day as I lay everything down at the foot of the Cross; my own intentions and the needs of the whole world. Bring Mary along with you! As we “Race for Vocations,” we get the opportunity to “Prayer for Vocations:” My Knights of Columbus council prays for vocations at the conclusion of every meeting. As my spiritual journey continues, albeit at a much slower pace than I like, the above prayer has become more significant and meaningful to me. Likewise, I have incorporated prayer into my running and other outdoor fitness activities. A race (like prayer) takes self-discipline. Looking back on training for the Mini-Marathon and a few 5k’s before that, I notice that there were a lot of ups; such as reaching goals and running 13.1 miles for the first time as well downs; such as sore knees and blisters. There were a lot of times I didn’t want to run but the one virtue that got me out there and running is self-discipline. Reflecting on this virtue I noticed that discipline is a vital part of our lives and is woven through the physical, emotional and spiritual aspects of them. A race takes discipline to train for and achieve. Getting up to run in the morning, encouraging yourself to run that one more mile and making time in your busy day to run all are evidence of this self-discipline The Lord gave us. In a lot of ways this training for the race symbolizes our discernment journey. Choices. Life is all about choices. One big question mark after the next: major, job, car, spouse, location, house, family, insurance. It never ends. And it’s easy to get caught up in the big questions of life. It doesn’t help that our culture is all about the sprint. A lot of hype for one event and then it’s over never to look back. Like January 1st diets that are already broken.